Supplementary info to Guide to Idaho Paddling: new paddle trips in central and south Idaho to try. 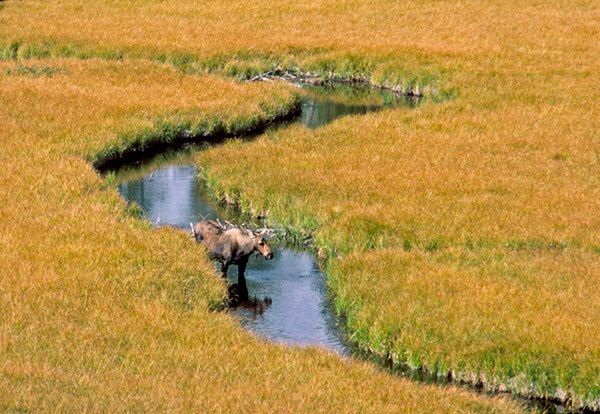 Free paddling maps for users of Guide to Idaho Paddling. Annotated list of the symbols and icons used on the Idaho Paddler's Website and in Guide to Idaho Paddling. Here are links to our other websites that you might find interesting . . .
Idaho Paddler's Website: a supplemental resource for users of the book Guide to Idaho Paddling. While this paddle trip is easier than the previous stretch on the river (the Chipmuck Rapids stretch), it does have some swift water early on to keep you on your toes. Most paddling on the Priest River is confined within a mixed conifer forest, but at the lower end of this trip the forest falls away and you'll be able to enjoy vistas of the Selkirks to the east. Difficulty: Upper part is Class I+ (1.3 - 1.4) which slows into a meandering Class I (1.1). At 3,000 cfs, McAbee falls is a Class I+ (1.5), barely a Class II-. For information on ratings, go here. Levels: 1,200-4,500 cfs at the Priest River gage. Note that boaters have run it down to 700 cfs and refer to it as "rocky but runnable" (source). Distance/Time: 9.4 Miles / 3-4 hours at 3,000 cfs. Getting to the Take-out. McAbee Falls Bridge. From the town of Priest River, drive 3.5 miles north on Idaho 57 and turn right onto the Peninsula Road. Follow the Peninsula Road for 4.5 miles until reaching a bridge over the Priest River. The take-out is downstream of the bridge on river left. Getting to the Put-in. Big Hole. To get to the Big Hole, start at the McAbee Falls bridge (described above) and drive .2 miles back towards the town of Priest River on Pininsula Road. Take a right onto Forest Service Road # 334. (This road is also known at the McAbee Falls Road or River Road.) Continue driving on this road, and at approximately 7 miles from Peninsula Road watch for the river. When you get close to the river (the river will make a "U" bend towards you), look for a small pull-off on the right, just big enough for two or three vehicles. From this pull-off you'll find a trail which leads down the river (about 200 feet from the road). Your put-in is at the bottom of the trail. Map. The area outlined in orange below is the area covered by this paddle trip. Note that if you have purchased a copy of the book Guide to Idaho Paddling, you can download a free high resolution PDF of this map. 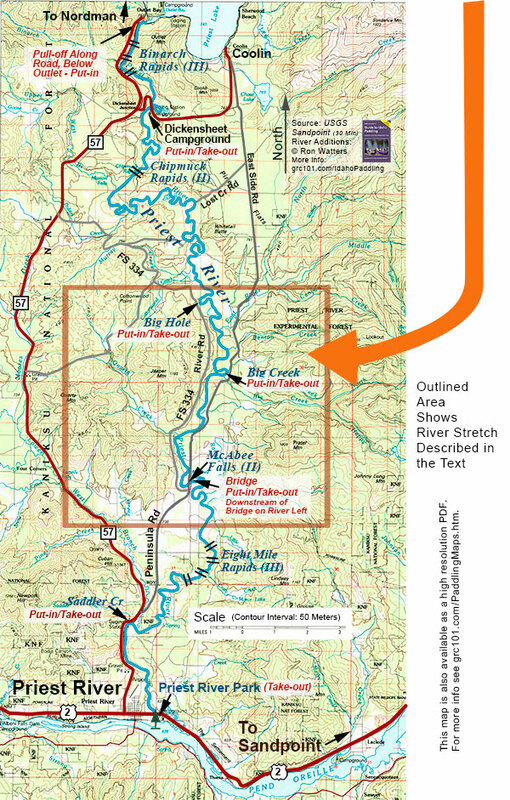 It is included in a special map booklet which also includes an annotated and detailed river map of this segment created from 7.5 minute USGS maps. You can download the map booklet here. The Trip. The upper part of the run has a few waves and swift corners. In a couple of locations, you may need to watch for overhanging trees on the outside of bends, but they are easily avoided by keeping to the inside. We thoroughly enjoyed the first half of this paddle. It has a graceful natural feel to it and is relatively free of development. If you keep a watch on the left shore, you'll be able to track your progress using several landmarks. The first is a large stream, wiggling its way into the river at 1.8 miles from the start. It's the largest of the Priest's tributaries on this stretch: East River. The next landmark is another stream, Benton Creek, joining the river on the left at the 2.7 mile point. The third landmark is the Big Creek vehicular access point on the left at the 3.8 miles. (This provides an alternative take-out or put-in if you need to stretch out or shorten trips down the river - or if you don't want to carry boats in and out of the Big Hole access point.) Finally, Big Creek, itself, comes in from the left at 4.2 miles. Around the 8 mile point, houses are plainly visible on the left. You'll swing around one more of those big "U" bends that the Priest is famous for, and the McAbee bridge will appear downriver. Under the bridge is McAbee Falls. "Falls" is a misnomer. It's really a small rapid, quite a small rapid. At 3,000 cfs, it's a class I+ (1.5) or II-. The rapids begins directly under the bridge and is quick little drop of about 5 feet or so. We found it easily run in the middle. Then it's through a couple waves and it's all over, a perfect way of finishing up this fine stretch of water. At the tail end of the rapid, a big eddy on the left will take you back to just downstream of the bridge and the take out. Shuttle. 8 miles, mostly dirt road. Bike shuttle possible. Craft. Kayaks, canoes and inflatables. Our thanks to our boating and skiing companions Gene Ratcliff and Judy Moyer of Athol. A Legal Reminder: running rivers is dangerous. It is the reader's responsibility to ensure that they have sufficient skill and fitness to participate in this activity safely. We do not assume liability or responsibility to any person or entity for injuries, death, loss or damages which are caused directly or indirectly by the information contained here.